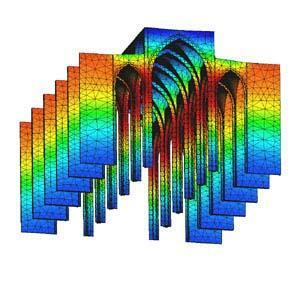 GiD is widely used for generating data and results visualisation in a number of linear and non linear problems in structural engineering mechanics using the finite element method. 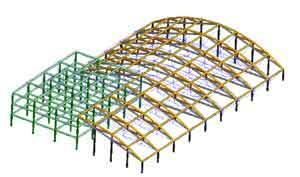 GiD includes the necessary facilities for generating structured and non structured meshes in civil, mechanical, aeronautical, aerospace and naval engineering structures as well as the deformed shape of the structure, displacements, stress and strain contours, crack patterns, line plots, etc. AGBAR Tower (Courtesy of BOMA). Structural analysis of the AGBAR tower (Barcelona). Study carried out with Tdyn–Ramseries. 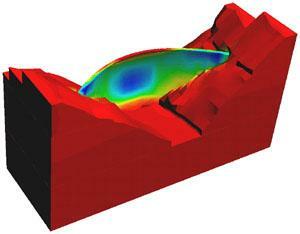 Structural analysis taking into account fracture processes on a concrete dam. The video shows (in different views) the contourlines of the displacements as the deformation evolves. Structural analysis of the Cathedral of Barcelona using 3D solid elements. This video of the Tarazona’s cathedral shows the evolution of damage when increasing the loads of structure gradually. Structural analysis of a double curvature dam taking into account soil-structure interactions effects.